It’s been a hectic (but quiet on the blog front) 3 months, and here we are in May already. I missed the updates for March and April, and amazingly we are looking at over 41% of my student loans paid off since the birth of this blog! That’s a whopping total of $39,247.65 paid off (41.3%) since the birth of the blog! I’ve been still paying my standard minimum payments (totaling about $557/month) and looking forward to the day (projected in about a year and a half or so) when that gets knocked down to $242/month. Unfortunately we’ve racked up a balance on the credit card, but have been able to pay it off each month; and there’s still the furniture (interest free for 12 months) we’ve been working on. The good news is that Mr. Bacon was finally promoted to full-time status at his job, which comes with amazing healthcare benefits (and even a pension!). He was even able to apply his 12 years of experience from a previous job, which moved him up the payscale by 12 levels–pretty insane (in a good way) how cut & dry that was. 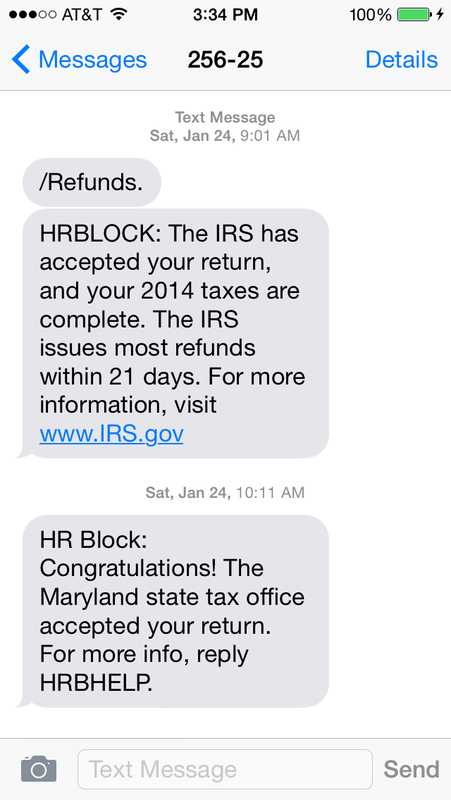 We also got our taxes done–I was able to manage getting the federal returns done on my own using the H&R Block software and we got over $1300 refunded. BUT the state returns were tricky since we lived in two different states, so I ended up paying someone $135 to get those done. We ended up getting about $250 back from Maryland and owed $380 or so to Delaware. Not too shabby! Other than that…we got A PUPPY! So much for no major life changes this year. 😉 That might explain part of why our expenses went up this month. Looks like I will be adding a budget line item for the Bacon Pup! My goal this month is to start using the budget categories in Mint.com again to get an idea of what they all are. On a Friday (Jan 23rd), I got my W-2. I spent the next day, Saturday morning, doing my taxes. It was not crazy like last year, when I owed over $2500 (see “ouch, my taxes!“). Nope, not so bad at all. 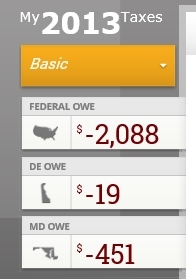 This year I owed Maryland $216 and actually got a $24 REFUND from the feds! Say, what! It was amazing how quickly my returns were accepted too, when you do them as early as the end of January. Within half an hour of submitting them, they were both accepted. I just checked my account yesterday, and saw that within a week, I got my huge $24 refund (Jan 30th).